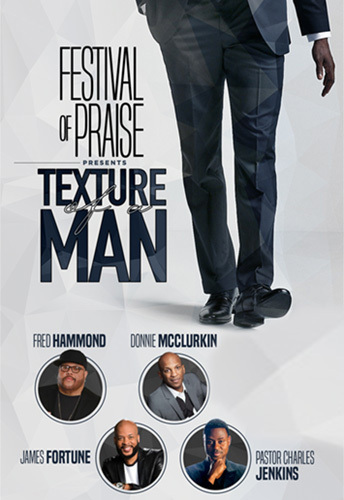 Face To Face, Inc. Presents the Festival of Praise Tour! The Festival of Praise Tour is bigger and better than ever! The tour was an enormous success last year and this year, this National Tour is scheduled to run from October to December 2018 as a 50+ city tour! The fantastic tour features Multiple Grammy, Stellar, BET Award Winning Artists Fred Hammond, Donnie McClurkin, James Fortune and Pastor Charles Jenkins. Ticket info will be released soon and will be available through Ticket Master and other outlets where concert tickets are sold. The ticket pricing varies based on the city/venue. Ticket pricing will not be available until the on sale dates. Can I purchase tickets on your website? We do not sell tickets from our website; however, we will provide a link to the ticket purchasing option for each city as it becomes available. Will we be able to purchase group tickets? Group ticket sales option may or may not be available for your area. Please email us at f2fmanagement@gmail.com with your request and contact information. Everyone is welcome at the Festival of Praise! Please keep in mind that a separate ticket is required for your child if they are going to occupy a seat.